Vern Cotter signed off as Scotland head coach with a 29-0 bonus-point victory over a wasteful Italy in the Six Nations at Murrayfiled on Saturday. The New Zealander will take the reins at Montpellier later this year, handing Scotland duties to Glasgow Warriors chief Gregor Townsend, but saw his side bounce back from last weekend's 61-21 humiliation at the hands of England to give themselves every chance of securing second in this year's championship. Tries from Finn Russell and Matt Scott gave Scotland a 15-0 lead at the break, as Carlo Canna missed all three of his penalty attempts for Italy, before Tim Visser and Tommy Seymour touched down in the second half. The result moves Scotland on to 14 points, although Ireland (10), France (10) and Wales (9) could yet beat them to second behind champions England with victories later on Saturday. Italy, meanwhile, fail to register a point for the second championship in a row. Stuart Hogg kicked Scotland in front from the tee but it was Italy who settled quicker and started to dominate possession and territory. Canna missed with a chance to pull the visitors level and claim at least some reward for their early good work, and Scotland soon took control. Huw Jones stumbled on the greasy surface after breaking the Italian defensive line, before Visser spilled the ball forwards from a Russell crossfield kick. Centre Jones picked up a game-ending injury as his chance came to nothing, but Russell eventually gave the hosts cause for celebration, bursting between two Italian defenders from five metres out before converting his own try to send Scotland 10-0 in front. Canna's profligacy with the boot continued to hurt Italy's chances, and Scott - on for Jones - extended Scotland's lead from a chipped kick that was palmed back by Hogg. A third missed penalty closed out the half for Italy, before Conor O'Shea's men contrived to throw away a glorious try-scoring opportunity shortly after the restart, with Hogg holding up Angelo Esposito out wide. Captain John Barclay's 10 minutes in the sin bin came at little cost to Scotland, as Edoardo Padovani failed to finish off another great chance for Italy to go over. Scotland again showed Italy how it was done at the other end, with Visser winning a foot race to hook the ball over the line with his boot and touch down shortly after the hour mark. Seymour then wrapped up the bonus point after being released down the right late on, leaving Cotter to hand over a Scotland team much stronger than the one he inherited. - Scotland kept a Tier One team scoreless for the first time since February 1993 when they beat Wales 20-0. - Scotland have won their last four home games in the Six Nations, the last time they went on a longer such run was a streak of six games between 1989 and 1991. - Scotland have won their last five home games overall, the last time they went on a longer run at home was a 13 game streak from 1989 to 1991. - Carlo Canna missed all three of his kicks at goal in this game; coming into this game Canna had slotted six of his seven shots at goal. 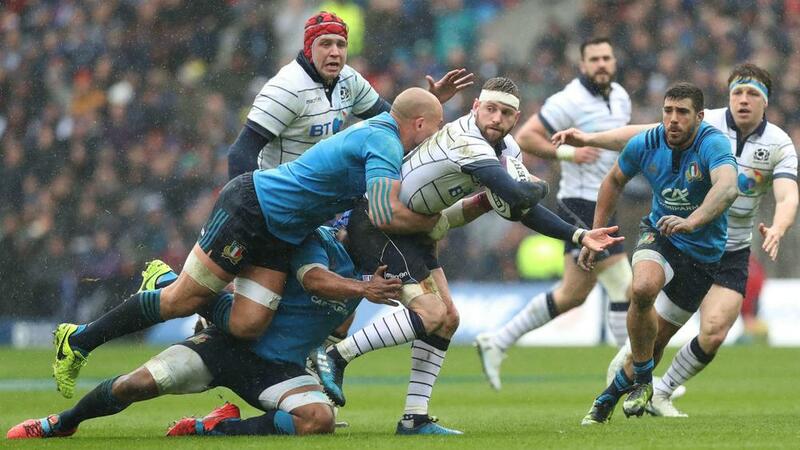 - Matt Scott scored his fifth try for Scotland in this game, three of his five tries have come against Italy.